Performances in the Park is the place to be on a Thursday night. From July 5 to August 23, 2018, the Gwen Ringwood Theatre in Boitanio Park will light up each Thursday evening with awesome musical performances from 6–8 p.m., along with food vendors, face painting, and children’s activities. Arty the Artwalker and ArtWalk 2018 will be part of the event starting August 9. Performances in the Park is a true community event. It is presented by the Central Cariboo Arts and Culture Society in partnership with the City of Williams Lake and the Cariboo Regional District, and is supported and sponsored by business and media partners. Each concert night sees between 500 and 600 spectators, rain or shine, who bring their lawn chairs and blankets or umbrellas and tarps (we are tough in the Cariboo), to enjoy the summer evenings and fantastic acts by talented local, national, and international performers. Despite last year’s fires, we set up five out of eight times. The team behind Performances in the Park gets into high gear in November to assure a fun-packed, family-friendly series the following summer. Angela Sommer of Angelkeys Music Studio, Performances in the Park co-ordinator, is co-ordinating the event, but she couldn’t do it without the help of staff and volunteers of the Central Cariboo Arts and Culture Society. 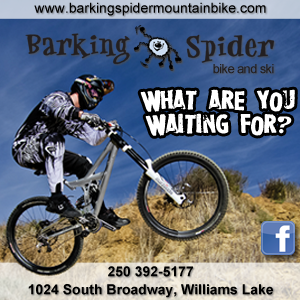 The business community in Williams Lake has once again been more than generous in sponsoring the performances. We couldn’t do it without them, so please take note of our wonderful sponsors and be sure to thank them for their support. 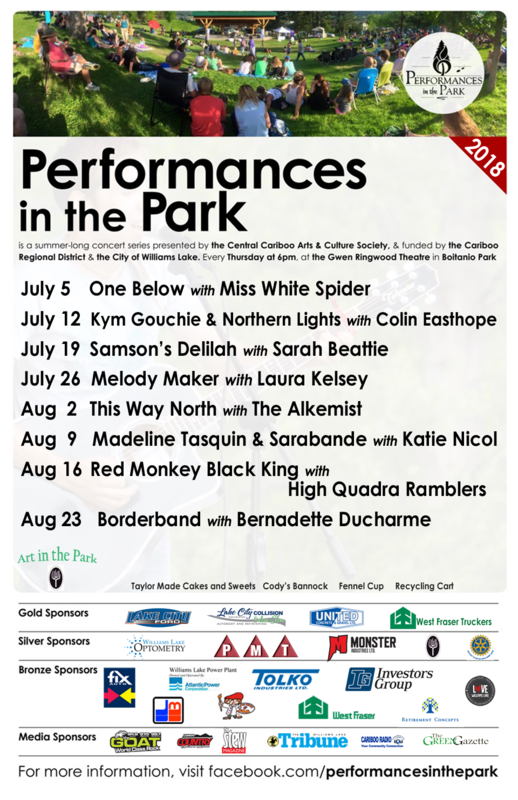 Our 2018 Gold Sponsors for Performances in the Park are Lake City Ford, Collision and Auto Glass, United Concrete and Gravel, and the West Fraser Tuckers. 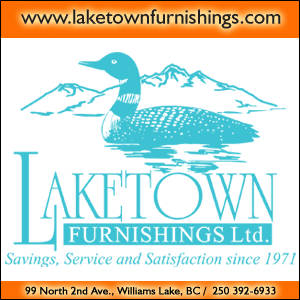 Silver sponsors are the Rotary Club Williams Lake, Williams Lake Optometry, Monster Industries Ltd., and PMT Chartered Professional Accountants LLP. 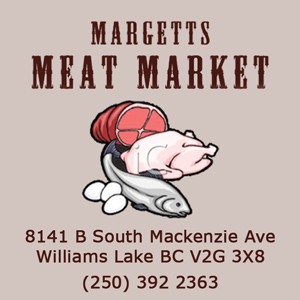 Bronze Sponsors are Chaps Fix Auto, Arty the Artwalker, Johnston Meier Insurance, Atlantic Power, Retirement Concepts, West Fraser Mills, Tolko Industries, Investor’s Group, and Love Williams Lake. 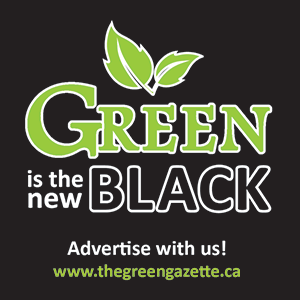 The Goat/Cariboo Country radio stations are our proud radio sponsors, the Williams Lake Tribune is providing weekly updates in print, The Stew Magazine and TheGreenGazette will feature articles and a schedule that can be put up on the fridge. Caribooradio.com will update online. Come out and enjoy the great music, fun atmosphere, tasty local food from Taylor Make Cakes and Sweets, Cody’s Bannock, and the Fennel Cup, and children’s activities by the Community Arts Council on Thursday nights in July and August. And, don’t forget to bring your friends!